Sandra and I spent part of our long leave this May on a spiritual pilgrimage to the Holy Land, led by the Catholic Archbishop of Cape Town, Stephen Brislin. It was a truly amazing and unforgettable experience. In between the wonderful visits to the places where our Lord walked, I was able to have a look at some of the birds and fish of the area. I was pleasantly surprised to see numerous Laughing Doves so common in South Africa. Of course the House Sparrow ( introduced to SA around 1820 by British settlers ) was common throughout. I was also surprised to find out more about the so-called Saint Peter’s fish. In the Scriptures, we know of the miracle of the multiplication of loaves and fish and reference is made to St Peter as the “fisherman”. On the banks of Lake Galilee, we had a great lunch of the local fish – and I was thrilled to discover that this fish is the Nile Tilapia, Oreochromis Niloticus. It is closely related to our very own Mozambique Tilapia, Oreochromis Mossambicus, with which I am very familiar having fished for them since I was 5 years old. The Tilapia species are important in Africa as they provide a useful source of protein. Both Tremisana Dam and the Breakfast Dam and the Klaserie River at Marc’s Treehouse Lodge are teeming with Tilapia. 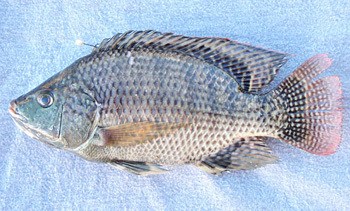 In SA the Mozambique Tilapia is known as the Blue Kurper. It is an interesting fish in that it is a mouth-brooder – fertilised eggs are kept in the mouth of the female until they hatch. Even once the fry are swimming freely they enter their mother’s mouth when endangered. There appears to be something fishy also in some of the guides’ reports – sometimes I wonder whether the sightings are really as good as they are reported … I suppose I’ll have to give them the benefit of my doubts. It was very good month for our local school and orphanage home in our nearest community in Acornhoek. 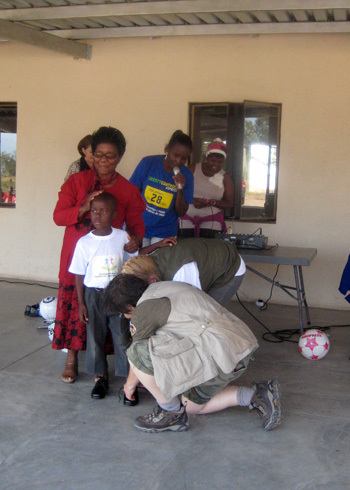 Together with nine guests from USA (Texas) I visited Funjwa primary school and Ekurhuleni orphanage centre. The volunteers were Barbara, Gary, Lew, John, Linda, Michelle, Dolores, Judy and Catherine. There were here for ten days for both safari and to help local people by doing some jobs and buying some basic needs for children – like school uniforms and to plant vegetable for orphanage home. We spent five days working at Funjwa and Ekurhuleni and it was very interesting to see the children get along with tourists. They bought (100) pairs of shoes, lots of soccer balls and donated some money to the school. I was enjoying every minute with them and I felt like I was on holiday as well. I would like to thank them for doing a good job for our local community – they will always remain in our hearts and may God bless them for whatever they are doing. At TREMISANA lodge there were four giraffes standing near the parking area. When we arrived at the walking spot, it was very quiet. The silence of the bush was broken by the sounds of elephants feeding. We went closer and discovered a large herd of elephants moving towards the stream. It was a great sighting and the giants were very relaxed. We left the area before they could smell us and continued walking. Some baboons went crazy and guinea fowl joined in as well. A few minutes later we heard a leopard calling so we went straight to the area to investigate. Along the way we heard lions feeding and we stopped to listen carefully. It was very close and we went into the bush to look for them but they ran away before we got close enough, but we found a carcass of a waterbuck – only the back side was eaten. The next day Texson and Chris went to the same spot to check – they only found two hyenas feeding and few vultures waiting for leftovers. We continued and very fortunately had a brief sighting of a leopard. The vegetation is changing slowly and in Kruger they have started burning the area to control diseases and parasites like ticks. We had a good sighting of two white rhinos drinking water at Nsemani dam. They were joined by giraffes, impalas and zebra – it was nice to see all of them together. After lunch we drove to Timbavati site looking for lions. We stopped at Ratelpan bird hide to watch some water birds, hippos and crocs. We were rewarded by the sighting of a white ( albino ) monkey amongst a troop of vervet monkeys. It was unbelievable to see it with the other monkeys. 7th of May was a very beautiful morning and I did a bushwalk with Chris. We started our bush walk after experiencing a wonderful sunrise. We had eight pax and everyone was excited and looking forward to this fantastic activity. Along the river front we heard branches breaking and we went to investigate. To out delight we found a young elephant all alone. We were surprised that the mother was not around. We viewed the elephant for five minutes and then the mother came and looked at us for about three minutes and we moved away. She started raising her trunk trying to get our scent. We continued to move away from the sighting very carefully. Later we heard baboons calling from the other side of the river. The calls were persistent and we quickly went to check what was happening. Chris spotted a pride of lions under the tree in which the baboons were. All our guests were very excited about the sighting. The pride consisted of eight lions in total – two young male lions and six female lions. Some of the guests who had good cameras managed to get great shots while others just continued to marvel at the sighting using their binoculars. After about ten minutes the lions spotted us and retreated into the thick bushes. We also managed to see a crocodile of about three metres lying on the sand bank. We stopped at some big rocks to have a break and two giraffes came to drink water opposite us on the other side of the river. We watched them drinking water and it was a very beautiful sighting. During another bushwalk on the 10th of May with Bongani we managed to spot a leopard drinking from a spring. While we were busy watching the leopard we heard some guinea fowl making loud noises. We went to take a look at what all the commotion was about. We found fresh tracks of lions including those of cubs. Unfortunately we did not see them. During the afternoon game drive I decided to continue searching for the lions. I did not find them but I was equally happy to find two hyenas busy feeding surrounded by a lot of vultures sitting in the trees. We also managed to see 2 black rhinos in the area. On the southern side of Shimbenjwana dam we saw a big breeding herd of Buffalos headed towards the dam. On the Barnard property we saw an impala carcass in the tree on the northern side of Xingaba dam but the leopard was not there. 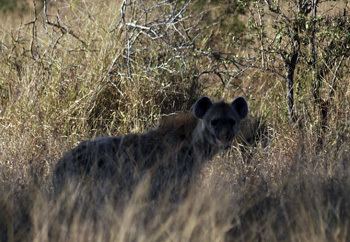 I had a brief sighting of a hyena. It is clear that we are in our winter season. The trees and grass seems to be dying and the mornings are reaching temperatures of only 5 degrees. We have once again managed to tick off all the big 5 on several occasions, and this month we have also been fortunate enough to see some of our more secretive creatures. On May 22, I conducted a Sunrise drive and we were greeted by two male giraffes taking advantage of the few leaves around. Whilst watching the giraffes, we heard splashing of water close by. I went to the nearby dam and there was a massive bull elephant sipping water. It did not go into the water because there was a hippo that suddenly emerged. After a few minutes of taking photos we went back to the lodge. The same evening on the Sunset drive we had a lucky start with a herd of seven Elephants making their way to the waterhole which is just a few metres from Tremisana Lodge. We had a few impalas and zebras on Nonwana then we headed in the direction of Marula Boma where we have dinner. After a nice bush braai and a beer we started heading back to the lodge. Barely 3 km from the Boma we found ourselves surrounded by 500+ Buffalos. I switched off the vehicle and all the lights and we listened to the sounds of these hundreds of Buffalos grazing and moving around. After spending a good 15mins we made our way to Tremisana. As we got near the lodge we found the most secret and shy animal you can find (Aardvark). This was my second time seeing this animal after 12 years living in Balule game reserve. The massive ant-eater was busy digging for termites when we found him, but as expected he ran off after a couple of seconds of my true admiration. On May 29 on the bushwalk we stopped for a spectacular winter sunrise. As we drove to the walking spot we came across a leopard which crossed the road and went into the bushes. As we were walking down a dry river bed there it was again – a massive male leopard. Really awesome and exciting stuff !! We then started walking along the river bank and we found 2 different hippo pod sightings. The first sighting we saw 4 hippos then the second it was 12 hippos. I am really looking forward to the dry season in June as we know the sightings will continue to improve. Everything around any corner. This day as I said was possibly the best day I’ve ever had in Kruger all my life. I had 8 guests in my vehicle and as always the jokes were flowing and the atmosphere had set the mood for what was going to be an epic day! We arrived at Orpen gate at around 9h00. Before even getting to the reception we had an elephant sighting, not the best but it was an elephant nonetheless and we stayed with him for a short time before making our way back to the gate to do all the paper work required and then dashed off all eager and excited for the day to come! We set off on the adventure into the park and not even 30 minutes into the drive we came across a male and female lion mating – we didn’t get to see the deed but a couple in a nearby car had assured us they were mating having spent a fair bit of time with them, fortunately we, alongside the other vehicle, were the only cars on the sighting and both had brilliant views of the lions right out in the open. The open vehicles that we use are an added advantage being able to see right over the other vehicle. About 10 minutes into the sighting another Kruger company informed me that about 10km down the road there were two leopards (a mother and her cub) in a tree near to the road so I told my guests about the sighting and after spending another 10 minutes with the lions we sped off towards the leopard stopping cars along the way to tell them about the lions and to confirm the leopards were still there with every car that we passed the excitement grew and grew but sadly when we got there the visual wasn’t that great but again the open vehicles we use did again come in handy being able to see the young leopard but not the mother through the bushes. I saw the leopard jumping from branch to branch and I told my guests to just trust me as I moved us forward to an open area where there was a tree not more than 5m away and as we got into the open area, as if the leopard was drawn to us, this young leopard about 7 months old climbed right onto the tree next to the car right into the open posed for a few photos and then went back down into the thick bush! Wow !!! This was an incredible start – leopard and lion not even 1 hour into the drive. We all knew that today was going to be a brilliant one, so after a while of back and forth driving trying to get another view of the leopard we decided to carry on in search of other things. A while down the road right in the distance about 700m we got a herd of buffalo but being so far away they just looked like black dots so we didn’t spend too long with them before moving off. We had brilliant elephant sightings all over the park topped with tons of giraffe and zebra sightings to the point where we would just drive right past having seen more than our fair share of them. At around 12h30 we stopped for lunch at Satara and I went around asking the other guides for any rhino sightings as that was the only one we were missing but sadly no one had seen any rhinos but my hopes were still high, as guides we never lose hope knowing the bush is full of surprises! So after a well-deserved meal we headed out again in search of animals, to all our surprises there was a lot of fires that day and I was taking a chance going to Timbavati area as that is where the fire was but it was also the area I had seen most of my previous rhino sightings. We made our way there and about 3km before the picnic site we were forced to turn around as the smoke got too much and we were all worried it could be dangerous. The bush decided to reward us after the torture of the smoke because as we came around the one corner we found 3 male cheetah walking together right on the road I couldn’t believe my eyes – all three big cats in one day!! Incredible!! We stayed with them being the only car on the sighting we enjoyed them until they eventually moved off out of sight and we carried on! By the time we got back to Satara there wasn’t much time for dirt roads and we were forced to take the main tar road back but still no rhino, so I tried every spot I knew for rhinos and stopped every car I could until eventually someone gave me a break and gave me the news I was waiting for, they had sighted a rhino in the river bed but rather far away, being the only sighting I had heard of the entire day we had to try and true as anything the bush blessed us with a sighting of one! Right in the riverbed and he even moved closer towards us allowing for brilliant sightings of him and he was a massive bull. After all this we made our way back to Orpen gate and again had the sighting of the male and female lion mating. We all decided that it would have been a little greedy to ask for anything else so we headed off back to our camps all happy with what was my best day in Kruger to date. 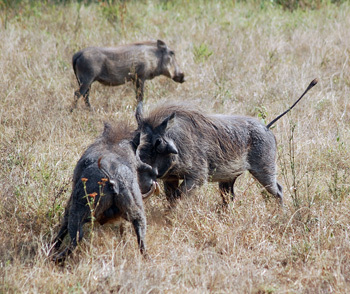 We are approaching the dry season which is good for game viewing. On the 3rd May we drove for about 30mins from Orpen gate with not much to report in terms of Big 5. As we came to Phelwane bridge road there were two male lions lying under an acacia tree about 100m from the road. An Impala was watching them from a distance calling to alarm the others. One male lion stood up to change his position towards the shade. The Impala which was watching them took to its heels. The second lion which was limping from the back leg went after the impala, but it could not go further then it came back to the shade. After 30mins we drove to Mzandzeni on S36. There was a leopard on a Marula tree with an impala carcass about 70m from the road. The leopard watched us for about 15mins then it stretched its front legs then went down to the ground and lay down. At about 12pm before we drove to lunch, we spotted on S100 a herd of elephants along the Nwanetsi River. Two of them walked up the banks of the river towards us and scratched against a Leadwood tree. We left the sighting and as we drove two more elephants were in the middle of the road. While we were watching the elephants a lioness came from the bushes passing through the cars crossing to the other side of the road then disappeared in the bushes. After lunch we drove to S40 and we came across a lonely hyena walking along the road and some Zebras grouped close together for protection in fear. At Nsemane dam we found mating lions and a rhino was seen from a distance. The next day we saw the same lions we had seen before with the one limping. Along the Timbavati River we found baboons fighting and the one was badly injured. 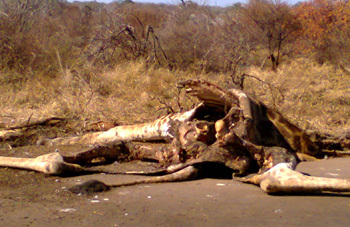 Between Satara and Tshokwane there was a dead giraffe in the middle of the road. The carcass looked like it was there for three days. Lions left the carcass in the morning and a few vultures were still on it. On a morning bush walk we came across a rhino and some giraffes. The rhino was not aware of us and we got very close. It looked in all the directions, but could not see us. It could only smell then it went the other direction from where we were standing. We were having dinner with my clients and a bull elephant visited the Boma area. Everyone was so scared when it lifted its front legs wanting to go over the bridge and come into the Boma. We have placed rocks all around. It tried twice then we had to make some noise to scare it then it moved away. It was exciting and at the same time the clients were very scared. We told them to calm down then after it had left they were all full of excitement. In any case I had my rifle and nothing serious would have happened. If necessary I would have fired a warning shot and the noise would have been enough to scare him off. The Kruger Park safaris have once again provided some great game viewing. As we move into our winter months, the once ample supply of water has decreased and the animals are relying on the more permanent water sources. This is great for game viewing as with a little patient and some keen observation one is able to witness very interesting animal interactions. This month my most memorable highlight was the battle of survival between two big male lions, a waterbuck and a very sneaky crocodile. While stopped at Nsemani Dam, a great place to view hippos wallowing in the water, we spotted two big male lions on the far side of the dam, looking with great interest at a male waterbuck on the other side of the dam. We then noticed the very large shape of a crocodile lying in the sun on the bank of the dam nearest to our position. The waterbuck was in a real predicament, either way he went he would be faced with danger. The waterbuck is known for its ability to dive into water and swim away from potential danger, such as lions. The crocodile however is very much at home in the water and this particular one was definitely large enough to take down the likes of a waterbuck. We continued watching to see how this scene would play out – my guests willing the waterbuck on to find a safe route out of danger’s way. After much thought and deliberation the waterbuck finally made a decision and took his chances with the crocodile. As soon as the waterbuck hit the water, the crocodile was off the bank and under the water – the hunt was on. With impressive speed the waterbuck was cruising across the dam, the crocodile out of sight. It was only as the waterbuck reached the bank that the crocodile appeared once again, with a wave of water the crocodile used its powerful tail to lung towards the waterbuck, yet much to the relief of my guests, the crocodile was unable to catch the waterbuck, this time. The next highlight of May 2014 would have to be a brilliant sighting of Wild Dogs. While en route to Orpen gate after a great lion sighting of six females walking along the Timbavati River, we received news of a wild dog sighting further down the road. The dogs were lying right next to the road when we got there with the alpha female heavily pregnant, always a great sign. While we were watching, the alpha male stood up closely followed by the rest of the pack, and continued to move along the road in front of us. It was the perfect ending to a great day in the Kruger. As one can imagine, my guests were exceptionally pleased. The morning drives in Balule are beginning to get very cold especially just before the sun rises, then warming up nicely as the sun warms up the air. Balule has continued to be a great place for close encounters with lions. While driving down Olifants main road I spotted some fresh lion tracks and continued to follow them down the road hoping to bump into those responsible. My luck was in and there moving along the road just ahead of us, were three big female lions. We caught up to them as they stopped in the road and had a look back in our direction, this wasn’t to look at us but rather at three more lionesses who appeared from the this bush behind us, and slipped past the vehicle. A great sighting and a superb way to finish off an animal-packed safari for my guests. The winter season is the best to see animals even at a distance and also at dams and water holes. A breeding herd of Buffalos were busy drinking water at Nsemani Dam and some were wallowing in mud. They were all relaxed when a pride of lions – 2 males and 3 females came from the bushes to the water hole. When the Buffalos saw the lions they repositioned themselves and all came out charging the lions. 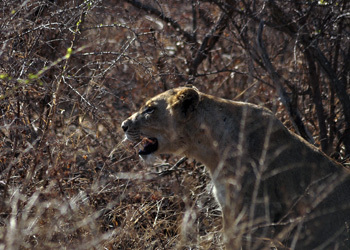 One lioness had to climb up a thorn tree about 4 metres high. When the lions saw that the Buffalos were coming in full force the lions ran away. While we were still watching a flock of very alarmed guinea fowl were running around making a loud noise. A Hawk eagle was busy pulling out the feather of a guinea fowl. Controlled veld fires in a conservation area can be fatal to other living creatures. A leopard was running across the road at Mzandzeni escaping rapidly from the veld fire. We enjoyed a great example of inter-specific competition between lilac-breasted roller and grey hornbill when a locust landed in the middle of the road. The two birds stooped down to catch the locust at the same time from different angles. They started fighting and locust dropped down. They continued fighting then the roller managed to fly away with the locust. We drove Timbavati River and there was a lioness on top of a termite mount licking her paws and looking up at an acacia tree. Later we spotted a leopard cub up the tree feeding on a duiker antelope. At Nkaya pan two lionesses were sleeping on the side of the dam wall. A male waterbuck came to drink water and one lioness tried to ambush him, but it quickly ran inside the water. The hippos were now chasing the lionesses away from the dam while the waterbuck was swimming in water. The lions ended up giving up and they moved away. Early in the morning while we were on a Bush Walk, a White rhino was with a calf was grazing about 50m away. Two young giraffes were playing (mounting each other which shows subordinating amongst young males).My guests were thrilled at such close encounters on foot ! We have completed the wall around the southern and western sides of the property. We are building a new store room. Game viewing has been good with many animals drinking at the waterhole in front of the Lapa as well as at Tremisana Dam. We have a borehole operated by a solar panel at the dam. With the cloudless winter days, we are assured of a good flow and Tremisana Dam will definitely not dry up. This is good as the water source will ensure good animal presence around the camp. We are seeing a lot more animals around the camp especially at the Breakfast Dam and along the Klaserie River. 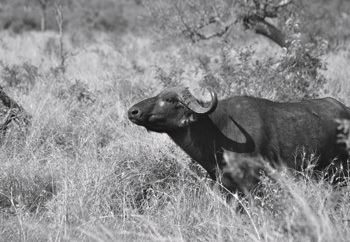 Buffalo and White Rhino are seen very often and we have constant sightings of Nyala, Impala, Giraffe and Zebra. 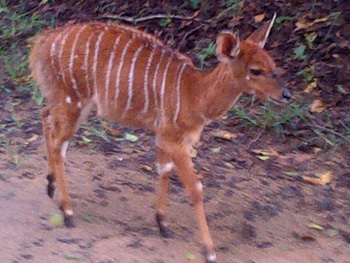 There are a number of young Nyala around the camp. We are renovating the treehouses one by one and are presently busy with number 5. 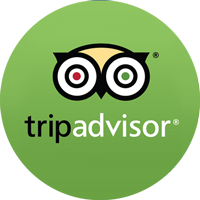 We expect to maintain our rates for overland safaris for the rest of the year. We hope that the petrol price doesn’t increase too drastically. However there will be an increase for self drive clients effective 1 July 2014. Self drive clients staying at Tremisana entering the Balule Gate are required to pay a Conservation fee. This money is being spent to combat rhino poaching. The 2015 tariffs will be available from 1 July. I travelled with my girlfriend to this beautiful lodge. It was the best trip ever and a great way to kick off our tour of Africa. The day we arrived at the lodge it was very warm and Rai welcomed us and gave us an introductory to.our safari. Always smiling Rai!! We went on the night drive and we experienced the most beautiful sunset ever. The next day was a.full day in the park. Awesome experience. I saw so many elephants that my heart almost stopped with excitement. Greatest experience. We are definitely coming back for our honeymoon. Thanks to the guides, Mama, Alice and lil Rai. You guys run an awesome machine. The Tremisana is located conveniently on a bush reserve. It is a small facility with about 15 units which surround courtyard with a pool. The vervet monkeys can be a problem however, do not leave your door open. It is the first property that I have ever stayed at that provides insect repellent. It is part of the Viva Safari program. For people who like a different experience. Had a beautiful treehouse by the river – so calm and quiet at night! Home-cooked dinner around the fire was lovely. Loads of Impala roam around the grounds, I was very sorry to leave. I’ve spent 3 nights in this lodge; for the ones who are used to regular hotels or hostels, just like me, it might seem a little bit unsettling at first, but it’s just a matter of a few hours and you’ll start loving the experience! The lodge comprises huts, treehouses and tents, and it’s not rare to see some innocuous animals getting close to the buildings and the nearby river. The staff is warm and friendly, they also improvised a typical dance for one of the guests’ birthday! I recommend it!